Nuns take a pinch of chemar, a mixture of butter and roasted barley flour, in celebration of the new year, Kopan Monastery, Kathmandu, Nepal, February 2018. Photo by Ven. Lobsang Sherab. The Fifteen Days of Miracles—from the first day of the Tibetan new year (Losar, February 5) until the fifteenth (February 19)—commemorate the special time when Guru Shakyamuni Buddha showed miraculous powers in order to subdue six Tirthika, or non-Buddhist teachers, who lacked faith in him, and to inspire more faith in his followers. It culminates on the full moon, the fifteenth day of the lunar calendar, which is the actual day of Chotrul Duchen. Losar is traditionally celebrated for three days, during which Tibetans spend time with friends and family, eat, play games, and relax. A number of rituals and customs have developed around it, such as the eating of a special soup called “guthug” on the 29th day of the last Tibetan month of the year, two days before Losar. In the monasteries, there is a Losar tradition to do the extensive Palden Lhamo puja before dawn. The Fifteen Days of Miracles are also a time for pilgrimage and intensive Dharma practice. 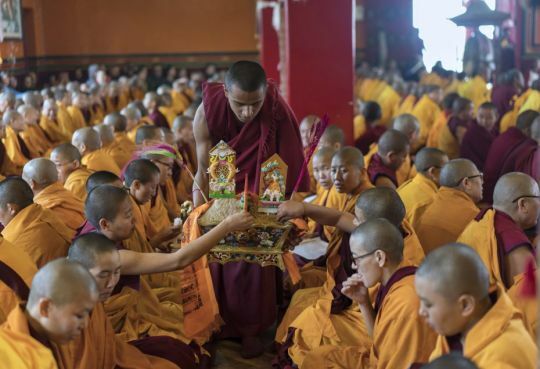 During this period, many Tibetan monasteries, including Kopan Monastery in Nepal, hold a Great Prayer Festival—Monlam Chenmo—for several days or even weeks during which the Sangha recite prayers from morning until evening. This year, Losar falls on February 5. The Fifteen Days of Miracles continue through Chotrul Duchen on February 19. All fifteen days are merit multiplying days, when the merit of virtuous actions performed on these days is multiplied by 100 million, as cited by Lama Zopa Rinpoche from the vinaya text Treasure of Quotations and Logic. Lama Zopa Rinpoche presides over Lama Chopa after the Palden Lhamo puja on the first day of Losar, Kopan Monastery, Kathmandu, Nepal, February 2018. Photo by Ven. Lobsang Sherab. For FPMT, Losar is a special time as it commemorates the anniversary of FPMT founder Lama Yeshe’s parinirvana at dawn of Losar in 1984. Lama Zopa Rinpoche asks centers to offer students the opportunity to offer extensive Lama Chopa with tsog in honor of this anniversary. Lama Zopa Rinpoche says that one generates incredible merit by offering tsog on that occasion every year. This Losar marks thirty-five years since the passing of Lama. Rinpoche also recommends that centers host annual events to introduce new students to Lama Yeshe. These events might include students who knew Lama Yeshe sharing their favorite stories, watching videos of Lama teaching, or reading stories about Lama. 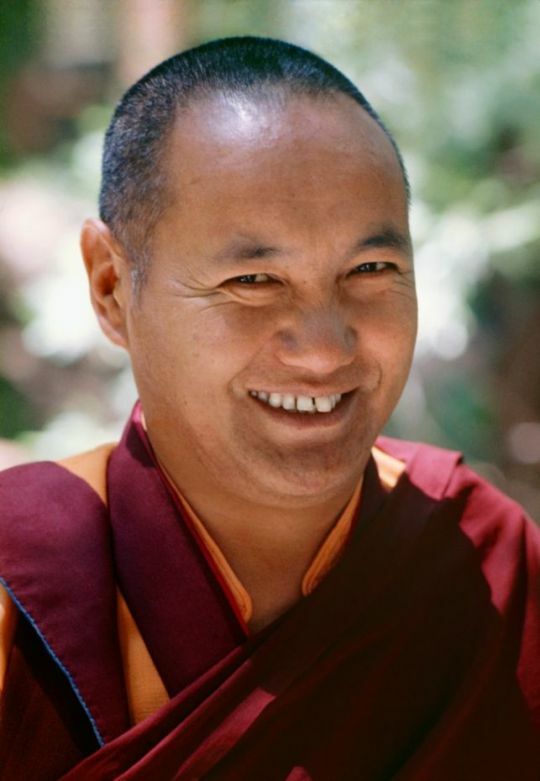 Lama Yeshe, Lake Arrowhead, California, United States, 1975. Photo by Carol Royce-Wilder, courtesy of Lama Yeshe Wisdom Archive. If the members of your community decide to recite the Sutra of Golden Light on these special days, we invite them to report their recitations on the Sutra of Golden Light reporting page. Losar Tashi Delek! Happy Tibetan New Year! Please keep in mind: According to the late Ven. Choden Rinpoche, one of Lama Zopa Rinpoche’s teachers, observation of auspicious days should be according to the date in India, not the date in one’s home country. 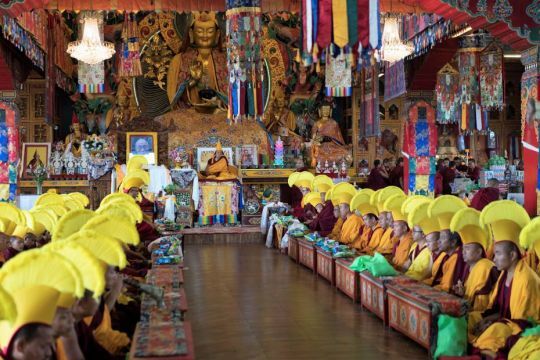 Therefore, when Lama Zopa Rinpoche is not in India, Rinpoche celebrates merit multiplying days and other auspicious dates according to the time in India. Special thanks to the Liberation Prison Project for preparing this year’s Tibetan calendar. A limited view of the calendar is always available on “Dharma Practice Dates” as a courtesy to FPMT students around the world.